It was "an unfortunate choice of song," Coupe says. Sainsbury's chief executive Mike Coupe poses for a portrait at one of the company's stores in London, U.K., Oct. 11, 2016. Coupe has apologized after being caught on camera singing 'We're in the Money' following the takeover of Walmart's unit Asda. 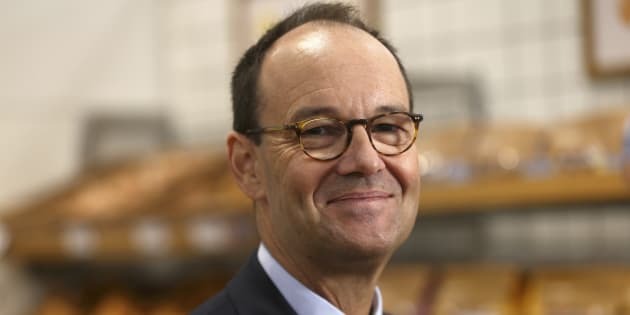 LONDON — The CEO of British supermarket chain Sainsbury's has apologized after being caught on camera singing 'We're in the Money' following the takeover of Walmart's unit Asda. Coupe sang "we're in the money, the sky is sunny, let's lend it, spend it, send it rolling along.'' He later described it as "an unguarded moment'' before settling down to speak. The value of Coupe's 1.28 million shares in Sainsbury's rose over half a million pounds ($750,000) Monday after the deal's announcement.